To take advantage of the GPU capabilities of Azure N-series VMs running Windows, NVIDIA GPU drivers must be installed. The NVIDIA GPU Driver Extension installs appropriate NVIDIA CUDA or GRID drivers on an N-series VM. Install or manage the extension using the Azure portal or tools such as Azure PowerShell or Azure Resource Manager templates. See the NVIDIA GPU Driver Extension documentation for supported operating systems and deployment steps. If you choose to install GPU drivers manually, this article provides supported operating systems, drivers, and installation and verification steps. Manual driver setup information is also available for Linux VMs. For basic specs, storage capacities, and disk details, see GPU Windows VM sizes. NVIDIA Tesla (CUDA) drivers for NC, NCv2, NCv3, ND, and NDv2-series VMs (optional for NV-series) are supported only on the operating systems listed in the following table. Driver download links are current at time of publication. For the latest drivers, visit the NVIDIA website. As an alternative to manual CUDA driver installation on a Windows Server VM, you can deploy an Azure Data Science Virtual Machine image. The DSVM editions for Windows Server 2016 pre-install NVIDIA CUDA drivers, the CUDA Deep Neural Network Library, and other tools. Microsoft redistributes NVIDIA GRID driver installers for NV and NVv2-series VMs used as virtual workstations or for virtual applications. Install only these GRID drivers on Azure NV VMs, only on the operating systems listed in the following table. These drivers include licensing for GRID Virtual GPU Software in Azure. You do not need to set up an NVIDIA vGPU software license server. Connect by Remote Desktop to each N-series VM. Download, extract, and install the supported driver for your Windows operating system. After GRID driver installation on a VM, a restart is required. After CUDA driver installation, a restart is not required. 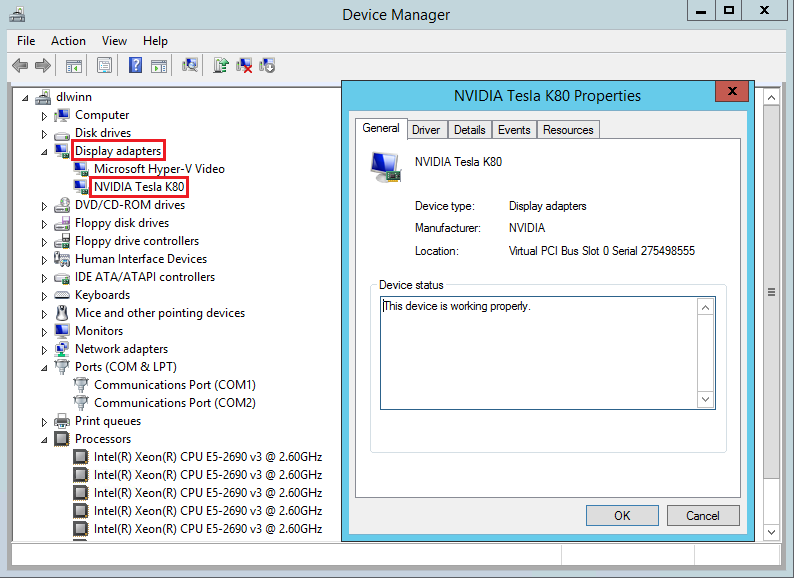 You can verify driver installation in Device Manager. The following example shows successful configuration of the Tesla K80 card on an Azure NC VM. To query the GPU device state, run the nvidia-smi command-line utility installed with the driver. Open a command prompt and change to the C:\Program Files\NVIDIA Corporation\NVSMI directory. Run nvidia-smi. If the driver is installed, you will see output similar to the following. The GPU-Util shows 0% unless you are currently running a GPU workload on the VM. Your driver version and GPU details may be different from the ones shown. RDMA network connectivity can be enabled on RDMA-capable N-series VMs such as NC24r deployed in the same availability set or in a single placement group in a virtual machine scale set. The HpcVmDrivers extension must be added to install Windows network device drivers that enable RDMA connectivity. To add the VM extension to an RDMA-enabled N-series VM, use Azure PowerShell cmdlets for Azure Resource Manager. For more information, see Virtual machine extensions and features for Windows. The RDMA network supports Message Passing Interface (MPI) traffic for applications running with Microsoft MPI or Intel MPI 5.x. Developers building GPU-accelerated applications for the NVIDIA Tesla GPUs can also download and install the latest CUDA Toolkit. For more information, see the CUDA Installation Guide.